Whereas calcium and sodium help muscles to contract, magnesium and potassium help muscles relax. A muscle cramp can be experienced when there is a deficiency in magnesium and potassium when muscles don’t properly relax after contracting. It therefore makes sense that magnesium and potassium also help with night muscle cramps. 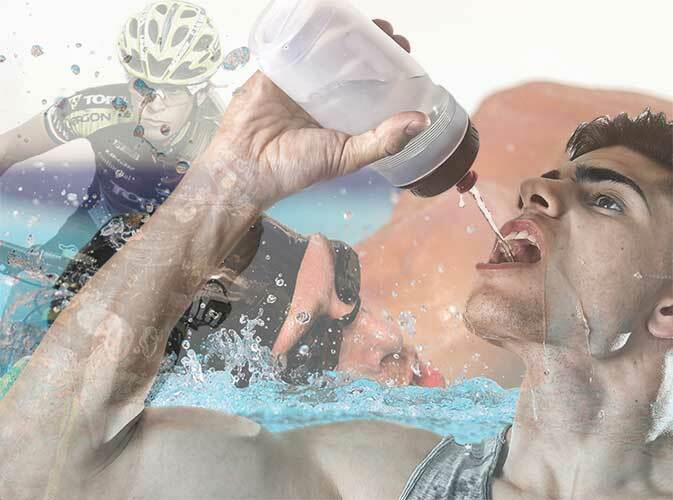 Since these deficiencies can occur when we lose large amounts of fluids, such as when we're working in the heat or participating in sports or other high exertion activities, supplementing is the logical solution. Our story starts in 1968, when Hartley Anderson read a series of newspaper articles written by Dr. George W. Crane Ph.D. 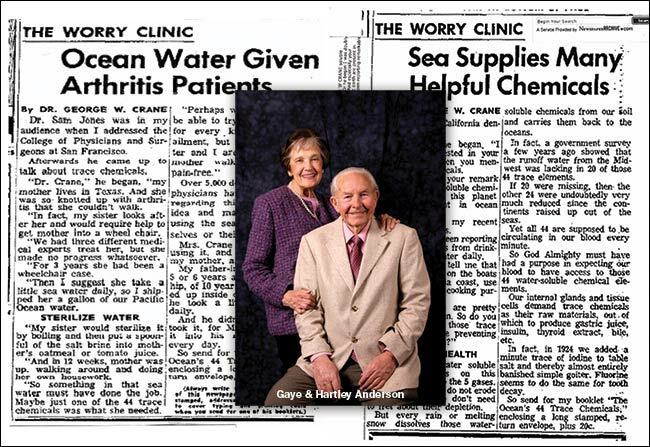 M.D., who published the amazing results people received from drinking small amounts of sea water daily. Dr. Crane theorized that the abundant minerals and trace minerals contained in seawater, played an essential role in maintaining optimal health. These articles struck Hartley like a lightning bolt, since he lived close to the Great Salt Lake in Utah. Hartley and his wife Gaye Anderson began researching the nutritional properties of the Great Salt Lake, a large Inland Sea, located in Northern Utah. The Andersons soon discovered that the Great Salt Lake contains is a purer source of the same minerals and trace minerals advocated by Dr. Crane, but six to ten times more concentrated than regular sea water. The Andersons and a few of their friends began consuming small amounts of filtered Great Salt Lake water and within a few days, began to notice powerful health results. They also found out that health food stores were selling filtered sea water. in 1969 the Andersons founded Mineral Resources International Inc. (or MRI) through a parent company and began selling their first product, which they called Inland Sea Water. Customer testimonials began to pour in, attesting to the effectiveness of this new product. Soon came the demand for a more concentrated, low sodium product, so the Andersons developed their flagship product, known today as Anderson’s Sea M.D. or Ionique Concentrated Mineral Drops. This was done using an all-natural, solar evaporation and precipitation process, which concentrates the minerals and trace minerals and removes over 99 percent of the sodium. A great deal of love and care goes into harvesting these ionic minerals because that is how superior results are achieved. MRI developed consumer-ready products based on the nutritional bounties from the Great Salt Lake, along with high-quality herbs, vitamins, and other nutrients. MRI also services private label and bulk ingredient customers in liquids and powders for the food, beverage, and natural product industry. 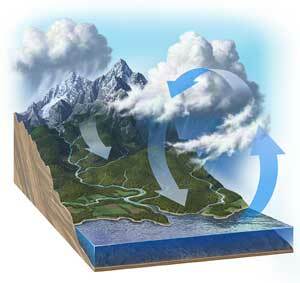 We humans have done a poor job with the concept of “replenish the earth,” especially in the last 40 years. This has caused our soil to become depleted of minerals. If minerals are not in the soil, then they simply cannot be in the foods we eat, unless we fortify. This epidemic of mineral and trace mineral deficiencies is causing a significant loss of health. However, as the soil becomes depleted the seas become enriched. Thus, supplementing our diet with minerals from the Great Salt Lake is the perfect solution. It has been over 50 years since that beginning. The second and third generation of the Anderson Family have taken the torch and it is so much more than just a business. It has been a stewardship and a mission, “To improve global well-being through mineral nutrition”. Lives have changed for the better, health and hope has been restored. These minerals along with pure water are perfect for efficient hydration and may be some of the most important factors for vibrant health. We invite you to experience the amazing results that so many others now enjoy.